What a handsome, BIG, senior, who still likes to chase squirrels. The best time of the day is snuggling and eating. Charlie is unbearably cute! What a joy to see big, dear Charlie as our beloved DOTD! Hi Charles Xavier Swanson, a.k.a Charlie! Happy Dog of the Day! What a cutie patootie, utterly precious senior Yorkie pupper you are, Charlie, your human's very own snuggle bear! And as for your less than Yorkie like heft? Every ounce of those impressive 18 pounds needed to accommodate your larger than life personality, your big heart! How lucky your mommy is, having a beautiful, energetic, life loving, sweet and snuggly, best furkid in you, Charlie! You truly are a treasure, one in a million, simply the best! Thanks for the BIG smiles, sweetheart! Meeting you today, seeing your utterly heart-melting photos, has been a real treat! Hope you enjoy a fun filled day and night of celebration...playing fetch and spin, hehe, and chasing squirrels; enjoying a yummy dinner; snuggling with your mommy; being loved and pampered to pieces! Lots of love, cuddles and smooches to you, precious Charlie, our very special and most deserving Dog of the Day, EVERY day!!! Last edited by tatsxxx11; 09-15-2018 at 08:37 AM. 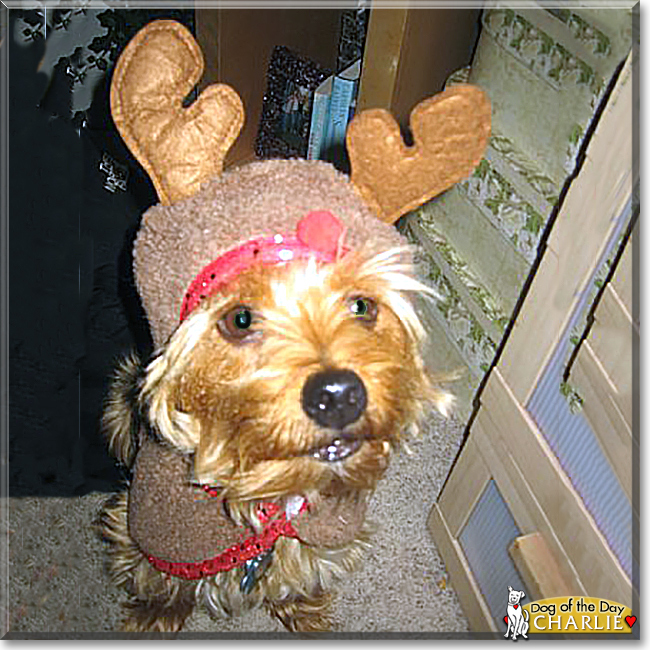 Congratulations on being Dog of the Day adorable Charlie!